I think it might have been Denis O’Brien who was asked many years ago about the then-current state of the mobile phone business. He told the business press that there were aspects of this complicated business that would ‘trouble Euclid’. Researching the major company we are looking at today, the British telecommunications conglomerate Vodafone Group, this may still be the case. It would have been hard to imagine when Vodafone first hit the streets back in the 1980s that mobile telephony would become the vast, global industry it has become. In the three decades and more, great step-changes have taken place. Vodafone’s first three chief executives assumed challenges of different sorts but the most recent incumbent, the Italian Vittorio Colao has had to untangle problems his three predecessors never encountered. The popular former McKinsey consultant, who recently announced he will hand over the reins in October, is credited with converting a scattered empire of mobile networks into a modern telecom company. There was even a view that prior to Colao’s arrival, Vodafone was in danger of implosion. When he arrived 10 years ago the group was still digesting its controversial takeover of the German group Mannesmann. It had screwed up an attempt to buy AT&T Wireless and, for good measure, had a major boardroom bust-up. In addition to these problems, the company was then solely a consumer-focused 3G operator. Since then Mr Colao has transformed the company into a converged broadband, TV and telecom provider. To achieve this, minority stakes were offloaded to focus on operations Vodafone controlled. The group lucratively exited the French, Chinese, US and Japanese markets and merged with its rivals in the Netherlands, Australia and India. It also developed operations in Spain (still struggling) Germany, Portugal and Italy. Today the group is in the premier league of European telecom providers. 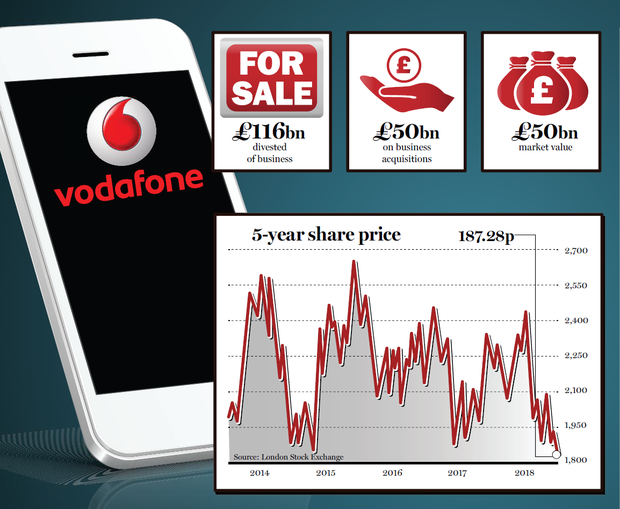 In total, Vodafone divested £116bn (€132bn) of business and spent £50bn on acquisitions. It invested £100bn in its network and returned £120bn to investors. The sale of its stake in the US telecom company Verizon for $130bn (€111bn) was the most eye-catching disposal. It bankrolled a huge network investment programme and paid investors handsomely. Mr Colao recently announced his intention to leave and the shares took a dive on the news. Before leaving he has paid €18bn for the cable networks of Liberty Global; it is a blockbuster. It covers Germany, Hungary, Romania and the Czech Republic. The deal also moves Vodafone’s centre of gravity away from the UK market. The deal with Liberty allows Vodafone to mount a challenge to the former state monopoly Deutsche Telecom, Europe’s dominant operator. The German operator, of which the German state controls 30pc, is unhappy with the acquisition and has indicated it will challenge the group at EU level. For all the impressive turnaround, the share price has been patchy and has fallen 30pc in the last three years. Today it trades at 187p, just above its yearly low with a market value of £50bn. Free cash flow exceeds £5bn, good news for the dividend, which currently yields more than 7pc. Growth has been hard to come by in the last decade and operators have been struggling to offset the decline of lucrative sources of revenue. New CEO in-waiting Nick Read has signalled the end of an era of blockbuster deals. In future the company will focus on cost reduction. However, if Sky exits its broadband operations, or Virgin Media, Liberty Global’s UK and Ireland TV company, hovered into sight, expect the new CEO to dust down his takeover manual. The recent moves will leave Vodafone in a better position to take on Deutsche Telecom and will be the latest attempt to consolidate a fragmented European telecom industry. In this sector operators have been struggling with low growth. Vodafone shares at the present price could be worth a punt.